1. In a large bowl, mix the cream, condensed milk, vanilla and salt with a hand whisk and beat until very thick. 2. Fold in one (230g) jar of Joe & Seph’s Prosecco Caramel Sauce, until completely mixed. 3. Get a plastic tub ready, and spoon the mix in tablespoon at a time. 4. To create the caramel sauce ripple, pour the caramel in and continue to layer the cream. With a knife, move it around to create that ripple effect. 5. Freeze for a minimum of 2 hours. 6. 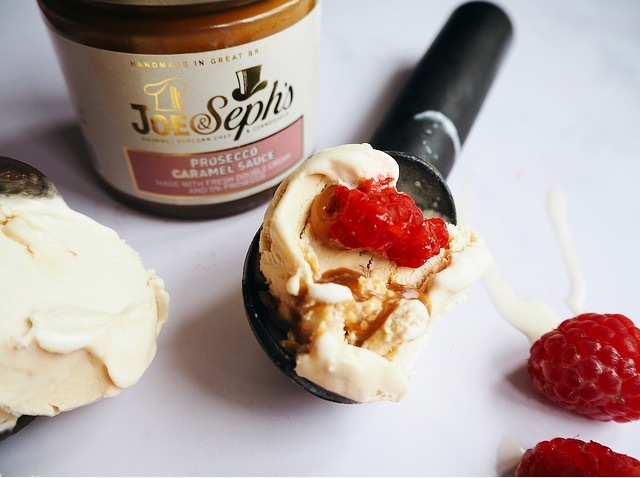 Drizzle plenty of Joe & Seph's Prosecco Caramel Sauce on top! 7. Serve in bowls, cones, waffles (sraight from the tub with a spoon...) and enjoy!